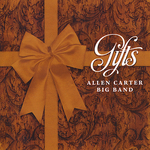 If there were any integrity or enlightenment in the music business as we know it in 2010not to mention among listenersdrummer Allen Carter's debut big-band album, Gifts, would surely go platinum or at least earn a well-deserved Grammy Award. As not much of either trait is evident on today's scene, neither of those outcomes is in any way probable. As consolation, Carter has the pleasure of hearing his splendid compositions and arrangements performed and recorded by an ensemble comprised of a number of the finest musicians the Southern California area has to offer, thanks to his friend, trumpeter Wayne Bergeron, who not only offered to assemble the band on Carter's behalf but also to play exemplary lead trumpet in the image of his role model, the late Maynard Ferguson. Carter wrote seven of the album's eleven numbers and arranged everything. Included are admirable readings of Jerome Kern's "Yesterdays" (tasteful tenor solo courtesy of Brian Scanlon), Toots Thielemans' "Bluesette" and a brace of unlikely big-band candidates, W.C. Handy's "St. Louis Blues" and the trad jazz evergreen, "When the Saints Go Marching In." The band, as one would surmise, plays Carter's charts impeccably, and there are impressive solos along the way by Carter, Scanlon (also featured on Carter's "The Gift"), fellow tenor Rusty Higgins (out front by himself on "Hey, That's No Lady! "), alto / soprano Dan Higgins, baritone Tom Peterson, trumpeters Bob Summers and Warren Luening, trombonists Andy Martin and Alex Iles, pianist Christian Jacob and guitarist Gary Solt. The rhythm section (Jacob, Solt, Carter, bassist Ken Wild) is remarkably snug and assured, especially when one considers that Carter's drums were recorded in Moorhead, MN, the ensemble in North Hollywood, CA. Ah, the wonders of modern electronics. Perhaps the best word with which to describe Carter's musical temperament is "happy." 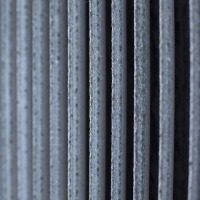 Every number is imbued with a natural buoyancy and warmth that makes it a pleasure to hear and appreciate. Of course, it doesn't hurt to have some of the most accomplished sidemen one could hope to muster reading the charts, which are invariably engaging, as is the entire album. Carter writes that recording his music with this band was a gift to him; the end result, however, is beyond any doubt a gift to us. The booklet accompanying this debut recording by the Lucerne Jazz Orchestra contains group and individual photos of the members of the ensemble, none of whom looks to be as old as thirty-something (and some not even close). 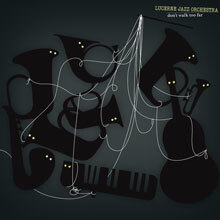 This is in itself remarkable, even more so when one considers the high level of musicianship and maturity shown throughout the well-designed, albeit too often ornate and strident, medley of half a dozen forward-leaning original compositions and one standard. All of the new themes were written by members of the orchestra including a pair ("Mellow Drama," "Default Value") by music director David Grottschreiber (whose photo shows a smiling young man who could plausibly be in high school) and the album's lone vocal, "Don't Walk Too Far," composed and sung by Karin Meier and arranged by Grottschreiber. Alas, as is true of too many "contemporary" songs, the lyrics are esoteric and indecipherable. But Meier's voice isn't bad, and baritone Matthias Tschopp does his best (with mixed results) to rise above the song's more dissonant passages. Rounding out the program are trumpeter Aurel Nowak's "Janoschs Welt," trombonist Silvio Cadotsch's "Lea Lucia," trumpeter Matthias Spillman's "Simpler Is Better" and the Jay Livingston / Ray Evans standard, "Never Let Me Go," a lustrous showcase for alto saxophonist Florian Egli. Even though Bob Brookmeyer isn't involved, much of the music seems to exemplify his latter-day point of view, and trombonist Edward Partyka's warm endorsement serves to underscore that appraisal.